Prefer to enjoy your drink at home? Set up a bar in the corner of your living room, your den, or the dining room. 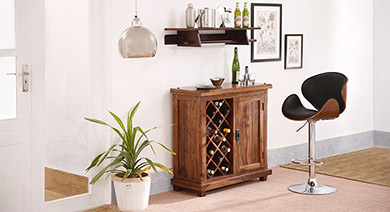 Explore stylish and spacious home bar furniture online. 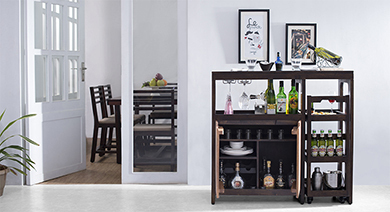 If you’ve always dreamt of having a bar at your home and are on the lookout for the right pieces, your search ends here! We have a stunning range of modern bar furniture for the home. Trendy and functional, our range includes everything from bar cabinets and sideboards to bar stools and chairs. 3. Take the party outdoors with patio bar furniture designs. Enjoy the beauty of being outdoors in the garden while having all your drinks and snacks handy. This outdoor furniture is great last minute party plans and entertaining guests on a cool night. 4. If you have a small space, look for a mini bar. Modern mini bar furniture is so well adapted to form and function, providing you with all the benefits of storage, utility, style and comfort. 5. For seating, the simplest and most economical option is a simple stool without a backrest. The most comfortable option would be an upholstered wooden chair with a backrest. Bar stools come in all sizes and shapes and can be made of wood, plastic and metal. Upholstered ones would be more comfy since you do want your guests to linger. 6. If you’re not for perching on high stools, invest in lounge chairs with comfy backrests and armrests. These have the advantage of being multifunctional. 7. A swivel chair with adjustable height is the ultimate buy. It tends to be more comfortable for longer periods and you don’t have to hang over the bar area awkwardly. There are plenty of options of bar furniture for sale and a lot of them may look very attractive, but in the end, always go for comfort over style. Visualize the space and decor of your home and invest wisely.